What if everyone in your company always communicated your strongest market position? 1. What is our unique position in our market? 2. What is our sustainable competitive advantage? Traditional branding and marketing approaches just scratch the surface, resulting in only minor variations of the expected and usual positioning statements or value propositions. Michel Neray developed the Essential Message D.I.G. 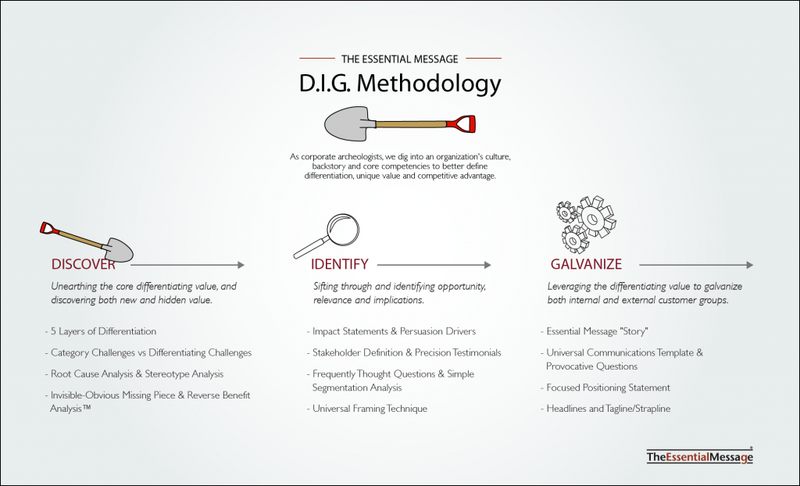 Methodology to help clients dig deeper – to discover their true differentiation, core strengths and strongest brand position. At each stage of the process, the D.I.G. Methodology is driven by counter-intuitive processes and exercises designed to achieve a deeper level of understanding, and genuinely fresh insights. Beyond better marketing, beyond stronger branding, and beyond higher sales, the feedback we get is it gives our clients the confidence, momentum and resilience that can only come from being absolutely clear about their strengths and unique difference both as a company – and as individuals. That’s how The Essential Message supports multiple objectives in team-building, core strategy, peak performance and leadership – as well as in networking, customer service, personal branding, and sales communications. For more information about Consulting, contact Michel.